FILE - This undated photo provided by the Cuyahoga County Medical Examiner’s Office shows fentanyl pills. Days after U.S. President Donald Trump declared America's opioid epidemic a public health emergency and labeled China a main source of fentanyl, a powerful and addictive opioid, officials from both countries held talks in Beijing to discuss anti-drug intelligence and cooperation efforts. Chinese state media said that during the meetings both sides "solidified a clear direction and detailed methods for the next phase of cooperation." A report from Xinhua news agency did not elaborate, but quoted a top anti-drug official who said the two should build cooperation. At a regular press briefing earlier this week Tuesday, China Foreign Ministry spokeswoman Hua Chunying gave reassurances that Beijing would be cooperative in its efforts to control fentanyl. "China has included dozens of fentanyl analogues into the list of controlled substances though there is no abuse of fentanyl analogues in China yet," Hua said. "The Chinese government has been actively cooperating with the U.S. and other countries within a framework as the law allows." Trump has said that the production and export of fentanyl to the United States is something he will raise next week when he visits China for the first time and meets with Chinese President Xi Jinping. Despite pledges and Trump's upcoming visit, fentanyl can be shipped through the post in quantities small enough that make it hard to detect, and distributors can still be easily found online, according to press and U.S. government accounts. VOA Mandarin spoke with a fentanyl manufacturer by phone who said they can still smuggle fentanyl to North America. Law enforcement officials appear before a drug distribution poster during a news conference at the Justice Department in Washington, Oct. 17, 2017, to announce the indictments of two Chinese fentanyl trackers. Last month, the U.S. Department of Justice (DOJ) announced its first indictments of Chinese manufacturers of fentanyl. The department indicted two Chinese nationals — Yan Xiaobing, 40, and Zhan Jian, 38 — over the manufacture and smuggling of fentanyl and its analogues into the United States. Hua said she was unaware of the specifics of the case. In a statement announcing the indictments, the DOJ said the case revealed a new and disturbing facet of America's opioid crisis. The investigations into Zhang and Yan “revealed that fentanyl and its analogues are coming to the U.S. in numerous ways, including highly pure shipments from factories in China,” according to the statement. "Unwary or inexperienced users often have no idea that they are ingesting fentanyl until it is too late," the statement said. “The United States Centers for Disease Control [and Prevention] estimates that last year more than 20,000 Americans were killed by the opioid and its analogues,” according to the statement. The National Institute of Drug Abuse estimates a higher toll — about 35,000 people. Opioids act on the nervous system to relieve pain. 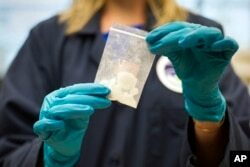 Fentanyl, a powerful synthetic opioid analgesic, is similar to morphine but is 50 to 100 times more potent, according to the National Institute of Drug Abuse. In the U.S., fentanyl is a Schedule II prescription drug, meaning it has a high potential for abuse which may lead to severe psychological or physical dependency. Fentanyl very quickly creates a tolerance to high doses, according to Narconon. It is typically used to treat patients with severe pain or to manage pain after surgery. This report originated on VOA Mandarin.